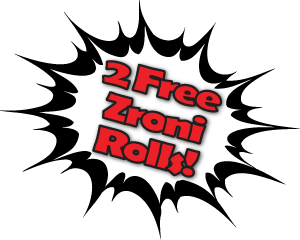 The Zroni Rolls are the best!! They are really good and easy to prepare. They are a great fundraising option and easy to sell!! Thank you for an excellent, easy-to-run fundraiser and a truly delicious product! Doing the Zroni fundraiser was the BEST decision we have ever made! We've tried so many fundraisers for our team, and we've never done the same thing twice - until we found Zroni. Betsy is super organized, and she made it SO easy for us. We have over 100 sellers and a lot of rolls to organize, and she took care of everything. We always had to do so much work with other fundraisers, but not any more! I must also add that the pepperoni rolls are delicious, and everyone loves having a quick and easy dinner in the freezer! We are so happy that we found such an awesome fundraiser with a quality product and such an amazing lady like Betsy to help us with it all! 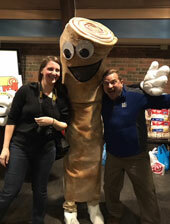 "Zroni Pepperoni Rolls is an amazing fundraiser and product! Betsy Gourley and her staff were awesome and very easy to work with! The delivery was prompt and very well organized. The pepperoni rolls were ABSOLUTELY DELICIOUS! We had several customers call and ask if they could order more. Betsy was very accommodating in the reorder! We have already scheduled two fundraisers with Zroni for next basketball season! Thank you Betsy for making an amazing product and an easy fundraising experience!" 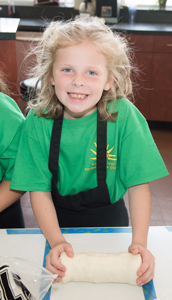 "Our students and parents love Zroni Rolls and we love working with Betsy! Every roll is handmade and delicious. This fundraiser allows our dance parents a way to raise money for their dancer's costumes, tuition and fees making dance affordable for everyone! Try them once and you will be asking when is the next sale!" "I do not typically like pepperoni rolls and only bought these to support a cause. Once I made them for my family I simply had to try a bite and BAM....life changed! These are the absolute best pepperoni rolls I have ever eaten in my life! Taken from a girl who does not even usually like them at all! I am now forced to fundraise these for life so that my family will still love me and stop going through withdrawals. Thanks you so much for these yummy goodies! I cannot wait to get some more!" 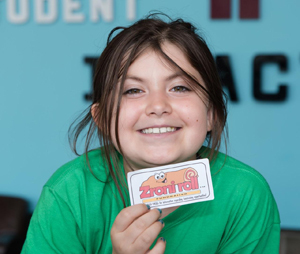 "We have been using the Zroni Pepperoni Roll Fundraiser for the past 2 years. Betsy is wonderful to work with and makes fundraising so easy! The pepperoni rolls are delicious and our families can't get enough of them!" "Zroni Pepperoni Rolls is a wonderful fundraiser. When you have a great product and good people to present it, the pepperoni rolls practically sell themselves. I had one student, who in just two sales was able to sell 84 pepperoni rolls and raised $420 for their trip to NYC! Many of the customers were repeats who just loved the product. This is a great opportunity and one that you should consider for your next fundraiser!" "What can I say but....WOW! Zroni Pepperoni Rolls was a fantastic fundraiser for our very large (130 girls) group! Every part of this fundraiser was seamless and professional. I was so impressed with all parts of this fundraiser, including the sleek packaging (she even provided the parchment paper for baking!!). Betsy provided a quality product that is easy to sell ... and in the end, profitable for our group! We will be coming back again!" "With three children having gone 12 years through Catholic schools, I have been involved with hundreds of fund-raisers. Nobody ever looks forward to raffle tickets, chocolates, magazines (etc.) but all of our Zroni Pepperoni Roll customers are eager to buy another. People are always hesitant to buy any product for a fundraiser, but they have been unanimously surprised and impressed with the quality and value of the Zroni Rolls. When we went back to them for the second and third month, every customer re-ordered and many bought two. Bottom line is that our boys were able to raise more than half of the cost of our Spring Baseball trip to Florida. THANK YOU." "My daughter raised $730 towards her People to People Student Ambassador trip to Austrailia through the Zroni Pepperoni Rolls Fundraiser! We were ecstatic with how much she was able to raise in two short months. This fundraiser was one of the easiest and best fundraisers we had the pleasure to participate in. Many places would not allow my daughter to do a fundraiser because she was an independent and not part of a group/team. Betsy was more than willing to work with us. All of our customers were satisfied with the Zroni Pepperoni Rolls and were asking when we were going to do the fundraiser again. So the second time we did the fundraiser they ordered 2 or 3 instead of one! I also liked the fundraiser because the pepperoni rolls came frozen so I didn't have to deliver all of them in one night! I would do this fundraiser in the future in a heartbeat! Betsy, thank you for making the Zroni Pepperoni Roll Fundraiser such a positive experience and helping my daughter reach her goal to to Austrailia! We will forever be grateful!"